2. Talk to Kahn [22:211]. 3. Talk to Eugene, Archy, and Mick [33:120]. 4. Talk to Zerd again. 6. Talk to Zerd and quest complete. 1. Talk to Eugene, Archy and Mick [35:132] two times each. 1000 exp and 200 fame. 500 coins and lose 100 fame. 3. Talk to Mira [62:148] in secret plain a recieve the shoe. 4. Talk to Village Head [21:215] again. He will give you 4 options to chose from, choose number one; "Try asking male villagers to try on the shoe"
6. Report back to Village Head. 3. Choose option "Yes, he told me about this." if you choose "Huh who'se loch" you lose 10 fame. 4. After gathering all four items return to Mira. 5. Return to Loah to end the quest. 1. Talk to Croix's wife in Croix's house [34:34]. 3. Talk to Mika in the Secret Plains. 4. Enter the Mysterious House. 5. Work your way through the maze and find Tarana in the upper left corner. 6. Return to talk to Croix and his wife. Upon completing the Saving Miss Veggie quest, I noticed that there seemed to be a "hint" that there was more so please keep eye out and let me know. 2. Talk to Kavana [12,17] by the Silver River in Western Grassland. 4. Talk to Drunk Dragon [75:217] in the south east corner of Genie Desert. 5. Give him one Vintage Shaoxing and Fried Pork. 6. Enter the cave and fight Water Owls for Vanilla Ice Cream. Each partymember must have one. 7. Go to the 2 on the map. Defeat 3 Dragon Guards (lv.60) within 5 minutes. 8. Give Hungry Dragon the Ice Cream. 9. Enter level 2 and fight Raptorians and Mud Crawlers for Blue Key ("key of transformation"). 10. Enter the door the in the upper right corner using the key of transformation and defeat Dragon Boss [23,46] (Lv.70, hp about 20.000) to receive a Peach. 11. Return to Kavana to finish the quest. When the three dragon guards are killed, The leader must disband the group (the Leader is the only one needing the IceCream. If you do this step correctly), Talk to the "hungry dragon". WAIT at where it gives you the option to click "HERE I GO" Type to everyone in "talk" mode" To Join you". Then click the "Here I Go" option". 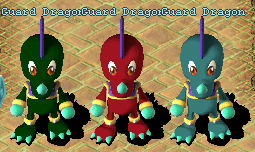 Note: If you fight the Guard dragon's and end up not having the icecream on you, and have to go fight monsters to get an icecream the guard dragon's appear to get harder the second time around. Note2: once battle has been completed and the dragon king is dead Everyone is to disband from Party Leader and talk to the King, the king then gives you the peach and teleports you to the entrance. Everyone who was there when the king died Finishes thequest and recives the peach. Note3: Myself and a group of others did complete this quest using the above method on July 08 2005, however 1 person did not get the peach, we re did the same above procedure and this time they did get the quest. (No clue why or what happened) so Use at your own risk and time.